Halifax, Toronto, Vancouver, Los Angeles, London. 25 February 2015. 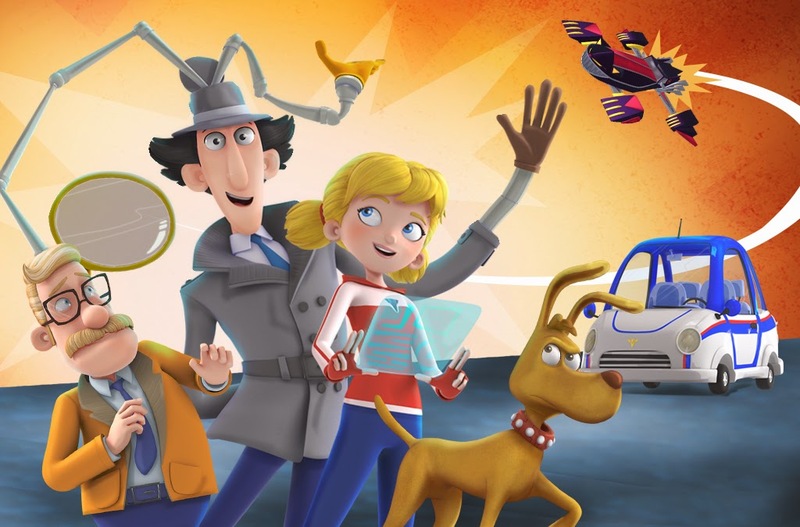 DHX Media, a key player internationally in the creation of content for families and children, has licensed Netflix as the exclusive US home for its new Inspector Gadget series. The new CGI, 26-episode series is expected to premier on Netflix US this March. It will also appear on Netflix at later dates in Latin America, the U.K., Ireland, Benelux, France and the Nordics following initial broadcast in each country. This puts a definite "outdated" stamp on the news from last June that the series would air on Cartoon Network in the States. After Cartoon Network recently announced its 2015-16 upfront without a mention of the Inspector Gadget reboot, I was half-way expecting Boomerang to be the show's destination in the U.S. too... so this came completely out of the blue for me. On the plus side, I'm guessing the series will be presented in HD on Netflix, which might perhaps not have been the case had it come to Boomerang in the States. Heard about this from Maurice LaMarche, who by the way wasn't even approached to play Gadget this time around. Aside from fan expectations, is there any reason why he should have been? Is Ivan Sherry really that bad, honestly? Looking at everyone in the main cast IMDB/Wiki pages, they are all Canadian. Maybe there is a law for Canadian shows to only cast Canadians? Connor: That's interesting. Did Maurice say this anywhere online? And do you know him personally? Sslaxx: "Is Ivan Sherry really that bad, honestly?" I'll have to agree here. From what I've heard, Ivan Sherry does a very good Inspector Gadget in his own right. Gadget's voice doesn't need to be a direct attempt at imitating Don Adams for me to like it. As much as I enjoy Maurice's talented VAing, I'm not really missing him that badly here. Ivan's take on Gadget is great, he brings something different to the character and I like it. I thought Doctor Claw was actually way funnier when he was played straight in the original series. Even if Claw had a ridiculous plan I could still believe in the motivations of the character and it worked. The dynamic of the show feels thrown off if I can't take Claw seriously. Cortoony: I feel the same way about Ivan's voice. The personality of the original Gadget feels intact, and Sherry's voice does seem to add something fresh at the same time. "I thought Doctor Claw was actually way funnier when he was played straight in the original series." I agree completely with this. I think the main reason Dr Claw actually IS so funny in the original series - specifically in season 1 - is exactly that he is presented as a powerful, intimidating criminal force. When a villain has such a forceful, scary personality, and STILL fails and loses his diginity, it becomes so much funnier. The contrast between these elements is what makes it hilarious. "Even if Claw had a ridiculous plan I could still believe in the motivations of the character and it worked." Mesterious: I'm friends with him on Facebook, and he shared this news along with mentioning he wasn't even approached. I really don't like Ivan's take on it simply because it just doesn't sound like Gadget. Right. Wish I heard about that earlier. I found Maurice's Facebook site, but it seems he already deleted his post on the new Gadget series. Would have liked to read the whole thing. Doesn't sound very professional of him. Ridiculous in that cartoonish villain way. Yes, eccentric. "I wish all involved with said "thingy" only the best." ""I wish all involved with said "thingy" only the best." Isn't he, though? ;) Me wanna read! Wouldn't you be mad too if you weren't even approached to play the character you've been playing for nearly ten years? If I felt like I was entitled to continue that role for whatever reasons, then sure.